My favorite dessert yet! 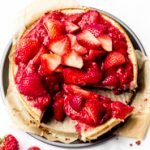 Baked strawberry cheesecake that tastes almost as good as the real thing. Made without cashews, without oil, and without refined sugar! Add crust ingredients (almonds, cinnamon, dates, and salt) to a food processor and process until a sticky crumbly dough forms (usually takes a good minute*). Press this almond-date mix into a baking dish or pan (I use this one – affiliate link), to form a crust. I line my pan with parchment paper to avoid the crust from sticking to the pan. Bake in the oven at 350F for 50 minutes or until the top of the cheesecake begins to turn golden brown. Prepare the strawberry jam. Add strawberries, vanilla flavoring, and agave to a saucepan over low/medium heat and cook until strawberries release their juices and are soft. Use a fork to press down on the strawberries to speed up the process. Takes around 10 minutes. Remove cheesecake from oven, let cool and then add strawberry jam on top with extra sliced strawberries on top. For best taste – let sit and chill in the fridge for a few hours before serving. The strawberry cheesecake tastes even better the next day when aged in the fridge. You want to make sure to process the almond and date mixture enough so that a sticky dough forms – but make sure not to over process or else you’ll end up with almond butter! The dough should stick together and form a crust easily. Soaking your dates will help. If you don’t have a spring form pan, like the one I mention in this post, then I recommend you line your baking dish with parchment paper so that you can lift the pie out of the baking dish once it’s ready to be served.